Toy storage that’s portable and easy on the eyes? We’ve found it. Any parent will tell you that toys tend to multiply, and often escape the areas designated to keep them contained (like playrooms and bedrooms). That’s why we love the portability of this toy storage solution. 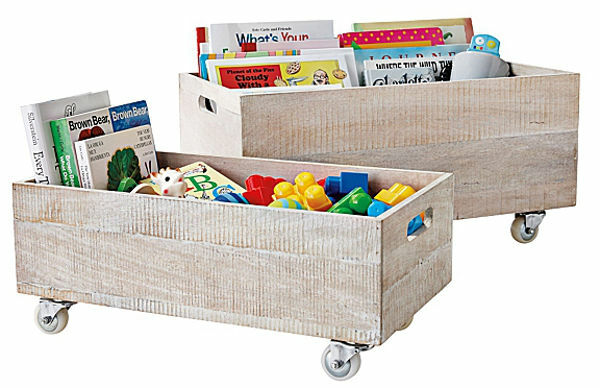 Serena & Lilly’s beautiful Rolling Storage Crates are a great way to contain toy mess, and move it from room to room. If you’re not partial to having toys strewn all over the living room, you can just bring out a crate when needed and then roll it away when the kids are done. They are also great for books, as a little rolling library. They have a beautiful whitewash, vintage finish and come in a small and large option, with cut out handles and white castors. They cost US$88 for the small size, or US$118 for the large. Serena & Lilly doesn’t deliver internationally though, so you will have to find a re-shipper.